Looking for a mattress that won’t break the bank? It used to be nearly impossible to find a bed at a reasonable price that was comfortable and would last beyond a year or two. They didn’t seem to exist. Now, however, with manufacturers selling directly to consumers, lower-priced mattresses are less of a rarity, at least if you know where to look. Should You Buy a Mattress That’s Cheaper than $300? Still, your choices are going to be limited, you’ll have to sacrifice the bells and whistles that some of the fancier brands offer as standard fare, but at least you’ve got options. In this article, we’ll share our top choices for best mattresses under $300. Arctic Dreams makes our list for its ability to remain cool under pressure, with three different cooling features that help keep its foams from overheating. It’s built by Dreamfoam, a sister company of Brooklyn Bedding, that is committed to providing excellent mattresses for those with tighter budgets. There are three layers of foam in this bed. The first is super soft and quilted to the cover for a plush finish, and the second and third are built to be body-conforming and responsive, so this bed should deliver a bit of bounce. What stands out? The mattress gets its name from three cooling features. The first is its breathable cotton cover, the second is its convoluted base that lets air flow through, and the third is a cooling gel that has been infused into a layer of specialty foam that is built to be breathable and similar to latex. If you want to know more about this model, check out our full review here. Zinus believes that it is not enough for a bed to feel great, they also want to help keep it smelling fresh with several natural additives to create their proprietary BioFoam®. This bed is available in a range of height that will also differ in feel from firmer, for the 8 inch, to more plush, for the 12 inch. What makes it special? 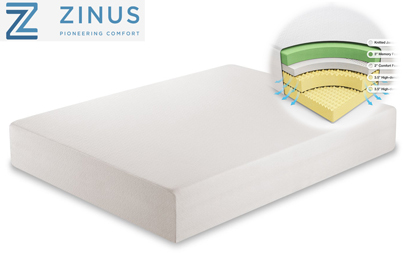 Though many bed-in-a-box foam brands can have and retain a slight industrial smell, Zinus has developed their foams to remain fresh smelling from the day you put it in your bedroom throughout all the nights you sleep on it. This is accomplished with a mix of green tea extract, castor seed oil, and charcoal. In addition to these ingredients, the bed’s designers have also striven to encourage airflow through the mattress, which also can influence the bed’s fresh smell. As an added bonus, these features combined also discourage bacteria growth and moisture accumulation. Want to know more about the Green Tea bed? Read more here. Zinus’ Ultima Comfort delivers a classic feel that is reminiscent of traditional innersprings with a few modern twists in the comfort system to help relieve pressure. Depending on the height you order, the bed will either be firmer (fewer inches of comfort materials) or plusher (additional layers of comfort foam). The top of the bed is built in a quilted Euro-style pillow top with layers of pressure relieving comfort foam, which is followed by a higher-density foam for deeper contouring. The foundation of the bed has a system of pocketed iCoil springs that stand 7.5 inches tall and help promote spine alignment. What stands out? The feel of this mattress is more traditional, but newer features bring the mattress up to date. The pocketed coils, for instance, should isolate motion a touch more efficiently than traditional coil systems. 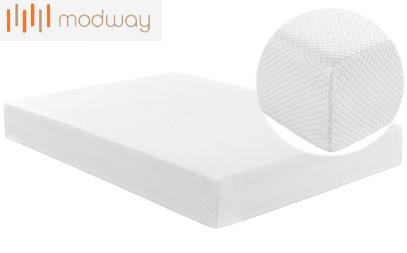 The pillow top of foam relieves pressure and cradles your body for a more cradling sleep, although the depth of the cradle will depend on which height you select. The Aveline mattress comes from Modway, a direct-to-consumer furniture wholesaler that has designed their own line of bed-in-a-box mattresses. The company specializes in mid-century designs offered for more affordable prices, and this bed is one of their bestselling models. What stands out? The Aveline’s streamlined structure contains two layers, one of a 3-inch gel-infused memory foam for body contouring and a denser base layer of poly foam that gives the bed its shape and foundation. The gel works to efficiently disperse heat through the foam so it shouldn’t build up in the space where your body rests, and the open cell structure of the foam should help air to freely flow through the materials. All of the foams in this mattress have been tested to a standard that measures the bed for unsafe levels of chemicals like formaldehyde or heavy metals like lead. You can rest easier knowing that your budget-friendly bed meets consumer health standards. The makers of Linenspa are committed to achieving high levels of customer satisfaction with a product that is much more affordable than the average bed-in-a-box, and the attractive price point has quickly made the brand an internet favorite. 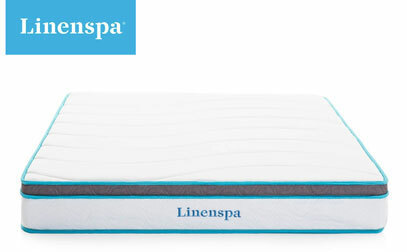 The LinenSpa 8” is a hybrid mattress with a sleek and streamlined design that includes memory foam over a traditional coil unit. What’s stands out? By incorporating more classic and streamlined design components, Linenspa is able to offer their 8-inch mattress for an exceptional price. Memory foam and coils combine in a way that should keep your back supported while your pressure points melt into the memory materials. 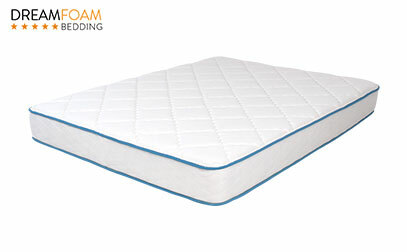 This mattress is listed as Medium-Firm, which is a firmness that typically works well with most sleeping positions because it offers a more versatile blend of materials. The tempered steel springs are in one connected unit, which can sometimes help prevent breakdown and sag over time. To make their products cheaper, companies have to take shortcuts to achieve a lower price point. If you think about it, the same principle applies to most products, whether it’s a car or a coffeemaker. The phrase “you get what you pay for” is famous for a reason, though there are a few exceptions for mattresses, which we outlined in the previous section. If you read the product descriptions of some of the cheaper offerings, they seem to say all the right things. But one thing that’s usually lacking is a CertiPUR-US certification. This certification is issued on foam products that meet safety standards for emissions, materials, and durability. This has become a fairly standard certification, so if a brand doesn’t have it, you may need to research deeper. If the certification does not exist, it can mean that the bed is likely laden with toxic fire retardants, harmful glues, and dangerous chlorofluorocarbons (CFCs). A bed that lacks this basic certification is potentially dangerous. 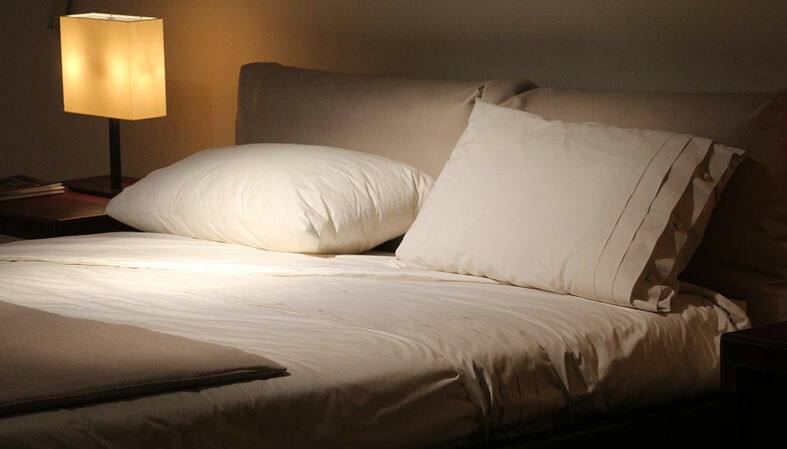 A bed with toxic foam can lead to a variety of health issues, including allergies, breathing problems, headaches, dizziness, and memory problems. To provide a product at a lower price point, companies often use lower-grade materials and less precise manufacturing techniques. The result can be a bed that lasts a fraction of the time that a higher-quality bed will serve you. The most noticeable issue you’ll experience is sagging, though there could also be rips and tears on the cover as well; it just depends on the brand you go with. If you want to see some of the top rated overall picks, you can see our favorites here. Because these lower-priced brands aren’t always built to last, they may have shorter warranty periods, if there’s a warranty at all. Don’t be surprised if it’s nearly impossible to meet all the requirements to file a claim. However, there are a few brands out there that even have 10-year periods and are higher quality; just do your research. When mattress companies want to discourage claims, they’ll stipulate that the surface can’t have any stains and sometimes they’ll require so much indentation (sagging) that the bed will have become unbearable to sleep on long before you meet the threshold. 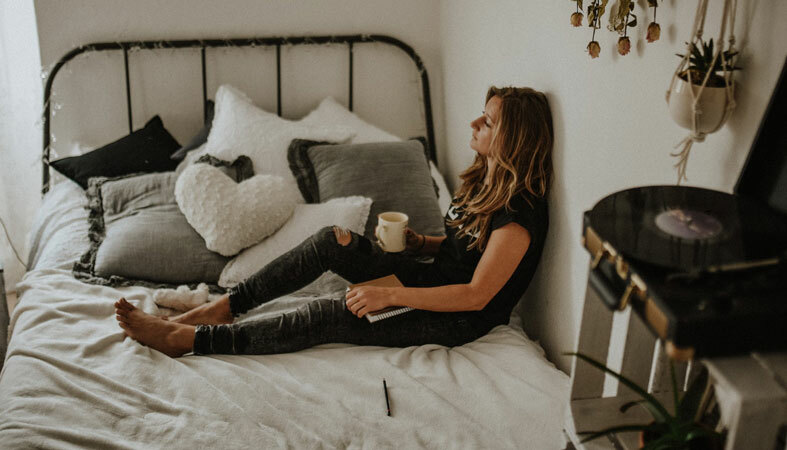 Forget such a wide selection of hybrid or innerspring mattresses, though they are out there and we included some top picks in this list. When it comes to something under $300, you’re mostly going to be looking at foam only. When should you consider buying one in this price range? There are situations when it doesn’t make sense to splurge on a bed. If you’re on a tight budget and you just need something to get by, a lower-priced item might be your best option. We also recommend buying something in this price range if you only need it temporarily. For example, maybe it’s for a college apartment, and you don’t plan on taking it with you after graduation. Or, perhaps your guest room needs a bed and you don’t need something particularly expensive. Generally, cheap beds can struggle as a long-term, heavy use sleeping solution. But, if you need a bed immediately, and you plan on in investing in a better one later, then you’ll do well by picking one of our recommendations. Or, if you're into some more browsing, you can see our budget picks here. Have you ever wondered why some memory foam brands are the price of a small car while others are less than $100? One of the price determinants is the quality and density of the foam. Density is a ratio that measures how much material is in something relative to the amount of air. Since lower density mattresses have less material and more air, they’re cheaper. The high ratio of air to material also means that the beds may be less durable because the material collapses under the weight of being slept on nightly. While density isn’t the only predictor of quality, it’s a logical place to start and will give you a lot of information about the firmness and durability of the bed. Density is measured in a unit called PCF, or pounds per cubic foot. Depending on the type of foam, the density standards vary. For lower-priced polyurethane polyfoam mattresses, an acceptable density range would be between 1.5 and 1.8 PCF. If you can find higher, that’s even better. If you’re on a budget, the best deals are online. This is because you’re buying directly from the company instead of paying the retail markup. You will will be hard-pressed to find a decent quality bed in a mattress store for under $300, so your best chance of getting something you can actually sleep on is if you buy it on the internet. See our boxed bed picks here. Memory foam is a type of poly foam that has been altered with chemical compounds to affect how it feels. Poly foam (also called polyurethane foam) is soft and springy but doesn't tend to last long. Most people are familiar with this material as what’s in couch cushions and (sometimes) cheaper “egg-crate” designs. It’s typically lower density than memory foam, which allows it to compress for shipping. A lot of mattress companies will use poly foam in at least one of their layers, partially because it is so easy to make compact. Both poly and memory foam are petrochemical-based, so again, make sure at the very least that the bed you choose is CertiPUR-US certified. There are some subtle differences in the feel of these two materials. Both provide a lot of softness, but there’s limited support with some polyfoam. 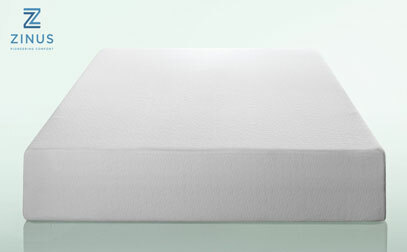 Memory foam allows for more contoured support, but it also comes with a higher price tag. Here you can see some of our favorite memory foam beds if you're interested. All foam-based mattresses will have a bit of an odor when you open the box. The smell is referred to as off-gassing, and it’s the result of the release of VOCs (volatile organic compounds) into the atmosphere. Some of these are completely harmless, while others are linked to allergies and respiratory issues. Again, check for safety certifications to ensure that you’re not breathing harmful chemicals. Depending on the mattress you choose, some have stronger off-gassing odors than other. We recommend letting it air out thoroughly before sleeping on it. In some cases, it can take up to two weeks for the smell to dissipate. If you need something quick and don’t necessarily care about keeping a bed for ten years, there are plenty of comfortable options that are available at budget-friendly prices. Now that you’re of aware of what to look for, and you’re armed with our top choices, you should be able to rest easy knowing that you got one of the best possible beds at the lowest price.